Camouflaged within the Highland forests and moors roams a predator, a lonely predator seeking shelter and food amidst thousands of years of persecution, a Scottish icon with a fierce reputation surviving through the most harsh conditions, a mysterious animal known as the Scottish Wildcat. It is said today that there are only 400 pure Scottish wildcats left within the Scottish Highlands, once also populating England and Wales they are now only found in the wilds of Scotland, surviving in only remote areas. The cat is now facing extinction and could be lost forever. 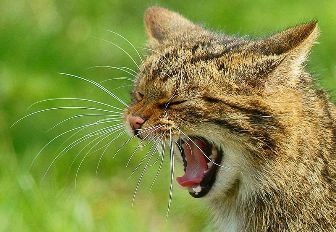 Surprisingly one of the largest threats to the Scottish Wildcat is in fact the domestic cat; they can pass on diseases and also breed with the wildcat diluting the species with hybrids taking away its pure breed and instincts. Some say most of the population are now interbred but you can’t be sure, various tests have been carried out to determine the purity but most of the cats tested when captured shown some signs of being hybridised. Out of the 3000-4000 cats still roaming the forest it is estimated only 400 are still pure wildcats. The cats have been shot and trapped throughout our history, and their environment has changed all around them, from farming and tree cutting to the changes in forest types effecting biodiversity has all caused harm to the Wildcat, these rare cats have also been culled when mistaken for feral cats, all through history it’s a sad story, it is now time to help protect the Scottish Wildcat. How can you tell the difference from a wildcat to a domesticated or feral cat, some features of the wildcat are the shape of the stripes on the back of the neck, a bushy tail with a black tip, rings along the tail and distinctive stripes that run down the lower back with a dorsal line that stops at the beginning of the tail. The cats can weigh up to 9kgs and are Fifty percent larger than domestic cats. The Wildcat is a formidable hunter and primarily hunts small rodents and rabbits, the cats can be very ferocious and it is said that they will fight till the death, the pure hunting skills and stealth are probably a large factor why the wildcat is still within Scotland, the cat is said to be untameable and will never be tamed even from a captive kitten.